-- [X] ... with at least 3 keyboard punctuation marks. [✔] with at least 3 keyboard punctuation marks C.L.A.Y. [♥] ... with at least 3 keyboard punctuation marks: Nanbaka: Shusseki Bangou no Tsuita Baka-tachi! -- [✓] ... with at least 3 keyboard punctuation marks. Little Busters! : Sekai no Saitou wa Ore ga Mamoru! 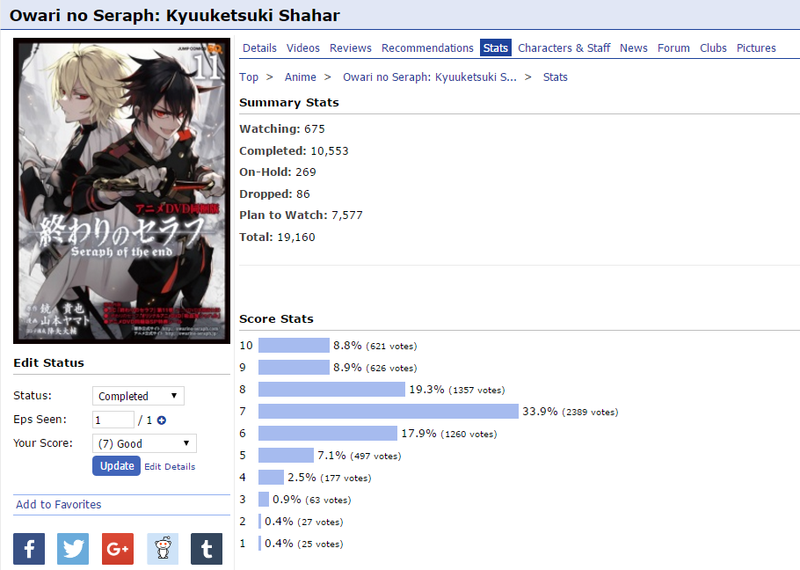 ... that has 5 or more words in the title - Yahari Ore no Seishun Love Comedy wa Machigatteiru. [✓] ... with at least 3 keyboard punctuation marks. -- [O] ... with at least 3 keyboard punctuation marks. - Durarara! !x2 Ketsu: Dufufufu!! [✓] ... that has 5 or more words in the title: Kono Danshi, Mahou ga Oshigoto Desu. [✓] ... that aired on the 19th day of any month/year: Kokoro ga Sakebitagatterunda. -- [✔] ... with at least 3 keyboard punctuation marks. / Gokujo. : Souda Onsen ni Ikou!! -- [✔] ... that aired on the 19th day of any month/year / Kokoro ga Sakebitagatterunda. -- [X] ... that has 5 or more words in the title... - Mondaiji-tachi ga Isekai kara Kuru Sou Desu yo? Series must be MAL tagged with 4 or more genres listedKeyboard punctuation marks are ! , - : ? ( ~ & TITLE EXAMPLE: Blah!!! 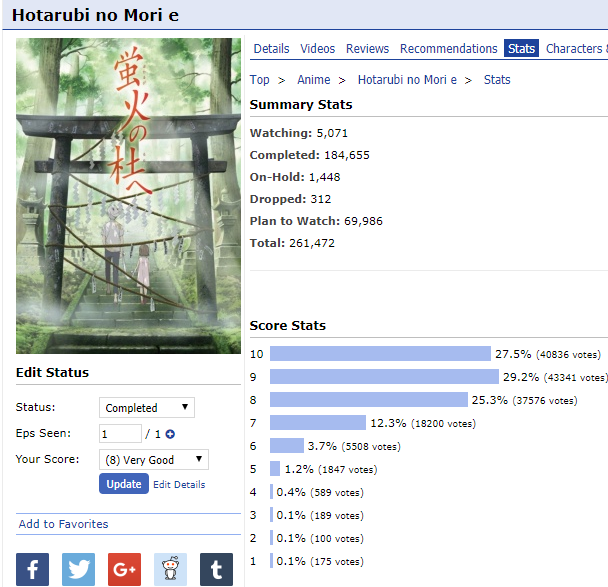 -- [✔] ... that has 0.5% or less votes for a rating of 1: Kimi no Na wa. with at least 3 keyboard punctuation marks. -- [X] ... with at least 3 keyboard punctuation marks. Keijo!!!!!!!! -- [✔] ... that aired on the 19th day of any month/year Himouto! Umaru-chan: Umaru-chan Mou Ikkai! 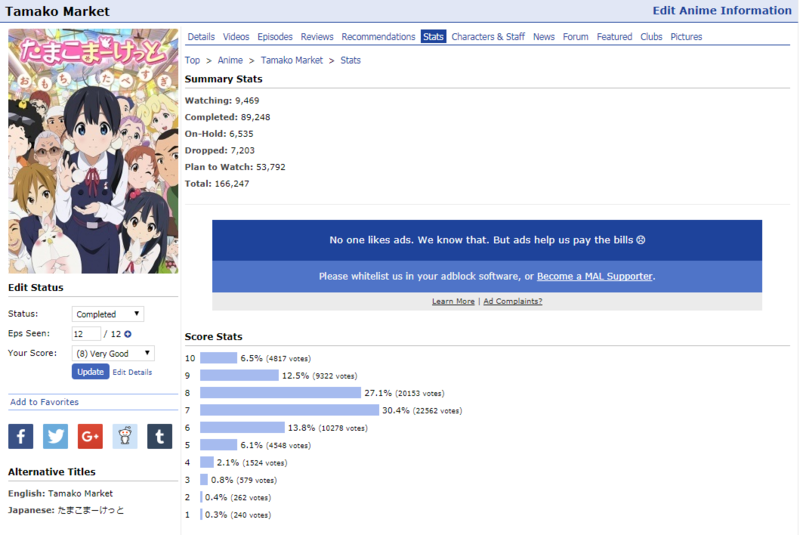 -- [✔] ... that is tagged with 4 or more genres Okusama ga Seitokaichou!+! -- [✔] ... that aired on the 19th day of any month/year: Kokoro ga Sakebitagatterunda. -- x ... with at least 3 keyboard punctuation marks. 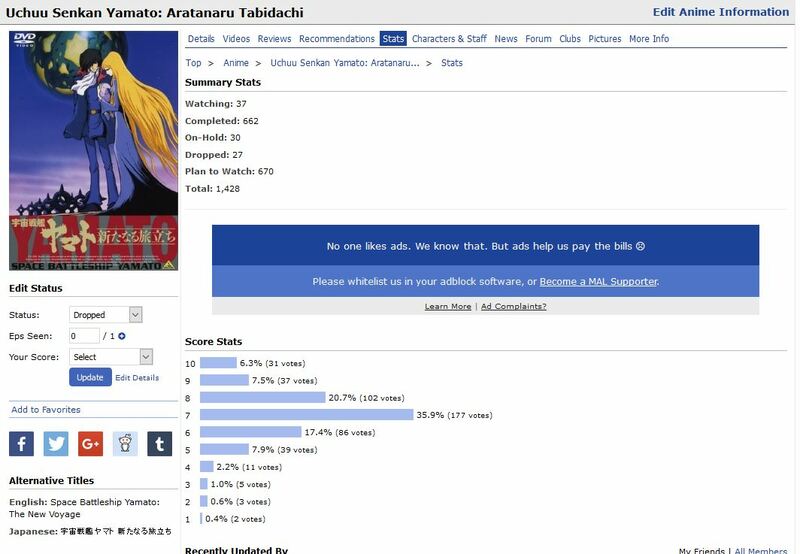 -- [✓] ... that has 5 or more words in the title Ano Hi Mita Hana no Namae wo Bokutachi wa Mada Shiranai. ... that aired on the 19th day of any month/year - Kokoro ga Sakebitagatterunda. -- [✔] ... with at least 3 keyboard punctuation marks Tokyo Ghoul: "Pinto"